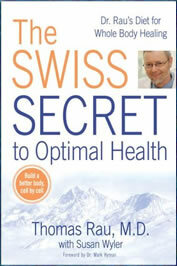 The Swiss Secret to Optimal Health is written by Thomas Rau, M.D. the Chief Medical Director of the Paracelsus Clinic in Switzerland, which specializes in natural medicine. In this book Rau discusses the role of nutrition for maintaining health as well as outlining his theories on how a detoxification diet can help to eliminate disease. He claims that when dieters follow his program, not only will they lose weight, but they will also experience other benefits such as a stronger immune system, total body cleansing, increased energy, and psychological rejuvenation. In addition he says that his approach will assist with the elimination of chronic health conditions such as diabetes, arthritis, and allergies. Rau states that eighty percent of the cells of the immune system are found in the intestine, so in order to maintain health and support cellular rejuvenation, it is necessary to provide the body with high-quality nutrition. The diet commences with an intense one-week period that Rau describes as a controlled fast in which you eliminate the intake of sugar, caffeine, processed foods, alcohol and animal protein. At the same time you will greatly increase your consumption of vegetables while consuming smaller amounts of fruits and whole grains. Rau says, “These foods provide a large amount of vitamins, trace elements, essential amino acids and essential fatty acids that are crucial for restoring ideal pH levels and loosening toxic blockages”. After the first week, dieters follow a three-week plan where larger portions are permitted and vegetables remain plentiful. The Swiss Secret program is not strictly vegetarian and each week you are permitted to include several portions of fish or chicken as well as moderate amounts of sheep and goat cheese. Fresh vegetable juice, vegetable soup, steamed vegetables, salad, apples, grapefruit, whole grains, olive oil, flaxseed oil, lemon juice, seeds, nuts, legumes, fish, chicken, sheep and goat cheese, herb tea. During the first week of the Swiss Secret program exercise is to be avoided and dieters are advised to also take a week off work so that they can rest completely and reduce stress. The Swiss Secret to Optimal Health: Dr. Rau’s Diet for Whole Body Healing retails at $16. May assist with recovery from chronic illness and with stubborn weight gain. Encourages a high intake of vegetables. Can be useful as a jump-start to a healthy weight loss plan. Includes over a hundred recipes. Many dieters will experience detox symptoms such as headache, nausea and fatigue, particularly in the beginning stages of the diet. May be too low in calories for physically active individuals and many dieters will feel hungry. Difficult to follow the program while maintaining regular daily routines. Recipes require a lot of time for preparation and often include unusual ingredients. The first week of the Swiss Secret Program is very strict and will be very challenging to adhere to while maintaining regular daily routines. In fact it is recommended that dieters take a week off work while undertaking this program, which may be a limiting factor for many individuals. This program will most appeal to highly motivated dieters that do not mind spending a lot of time on food preparation. The detox aspect of the Swiss Secret may be beneficial for dieters with chronic illnesses as well as those who have struggled to lose weight with traditional methods without achieving success.